Roxie Ray’s paintings capture field workers laboring in rising heat, bathers languidly floating. The paintings are at once realistic depictions of everyday life and socio-political statements. The viewer is caught in ambiguous situations, observing faceless yet very human figures, anonymous, marginalized. Roxie notes that, for her, painting — like life — is not always an easy process and can be painful. She begins with an idea that moves into motion with a philosophical undercurrent, then reaches into color and contrast, achieving atmosphere in her work. 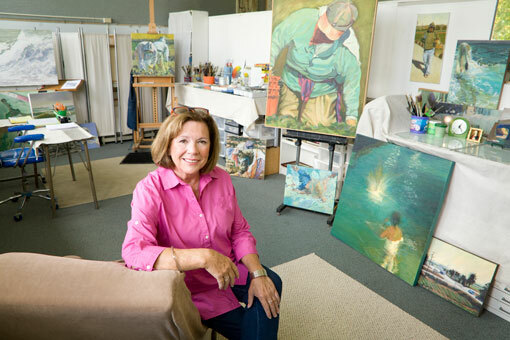 Roxie is a proud founding member of Studio Channel Islands Art Center located in Camarillo, CA.